Updates: Event Page Total Revamp! With this update, all events will now be sorted through the Time Stamps of each events. Members or Admins of the clan can now easily determine and easily manage their events with this. When you go to your Events Calendar on your Home page, hover over a date on your calendar and you can now see that events are properly listed on there with their corresponding tournament dates. Also, when you see an event that has a strikethrough, it means that the event is already full but you can still click on “Attend” button if you want. Since there was discrepancy between the time you’ve added an event and what’s shown especially for tournaments, we have fixed this minor glitch and you can now be notified correctly no matter what time zone you are using on your computer versus the time that the event was setup on your website. When you have attended an event, and when you hover the upcoming events on your Events Calendar, there will be small popup that will remind you of the events that you plan to attend. Nifty isn’t it? In relation to the feature above this one, the events will automatically be sorted out based on the time zone that your computer is using currently. So, therefore, you don’t need to setup your timezone settings on your iClan Website account. We made it easier for you. You can now filter your events by using tags or colors. 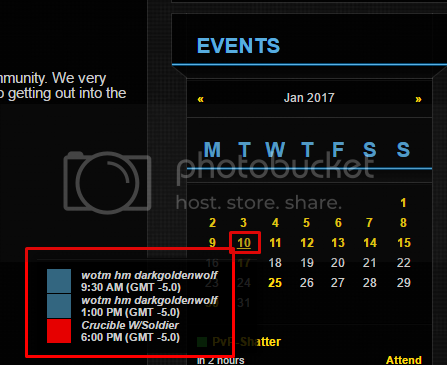 Clans that has humungous list of events can now easily sort out their events using tags or colors. It is pretty much all you need for an event calendar. And that’s it! We hope that this update can help many iClan users out there that are having trouble with organizing their Event schedules for either big tournaments or just minor events. Stay tuned for our next big update for the next month. Keep those votes coming for your favorite features! Great! And a Happy New Year To you all!